The origin of the Kernan family has been on one level quite straightforward and on another very elusive, a fact resulting from both oral family history and available historical records in North America for the family. Although these sources are quite clear regarding the ancestral country of origins of the family, little else is clear from them, particularly the specific county and city (or village) they came from. However, recently made available historical records in Ireland has provided these details. What is presently known about the origins of the Kernan family from oral family history and historical records will be discussed in the following, as well as the origins of Kernans in general. Although there are some discrepancies between them, oral family history and available historical records for the Kernan family are clear about the country of origin for the family. According to both of these sources, the Kernan family traces back to Ireland. Oral family history on the subject of the origin of the Kernan family has been consistent over time. Although it was never much of a tradition to talk about such things, when the subject was ever brought up, it was always quite clear that the Kernan family came from Ireland. Additionally, it is clear from family documents that such a narrative about the family’s origin has been repeated across generations. The Bible of Delmar Clair Kernan (1908-1979), the father of my paternal grandfather, provides genealogical details about his father and grandfather based on what he had been told, and it clearly identifies Ireland as the ancestral origin of the family. North American historical records for the Kernan family are equally clear on the subject of the origin of the family. These records clearly state that the family is of Irish origins. The earliest of these historical records for the family that are relevant to the issue of origins are the Canadian birth and baptismal records for Owen Francis Kiernan (1836-1901), my grandfather’s great grandfather, and two of his siblings. Owen’s 1836 birth and baptismal record states his father, Felix Kiernan (ca. 1796-1882), was a “natif de Irlande,” which is French for “native of Ireland.” The birth and baptismal records for two of Owen’s siblings, one dated in 1834 and another in 1839, both note “Irlandais” (Irish or Irishman in French) when referring to their father, Felix. Another early historical record for the family that is relevant to the issue of origins is the 1851 Canada Census. According to this record the family was living in Sainte-Monique, Quebec, Canada at the time, and the oldest members of the family are recorded as having been born in Ireland, with the younger ones having been born in Canada. Similar details about the origins of the family can be found on the earliest available historical record for the family in the United States, which is the 1857 Minnesota State Census. According to this record the family was living in Bismarck, Sibley County, Minnesota, and again the oldest members of the family are enumerated as having been born in Ireland. Several other historical records for the family also identify Ireland as the ancestral origins of the Kernan family. The 1860 U.S. Federal Census shows the family living in Dryden, Sibley County, Minnesota; and as with the 1851 Canada Census and the 1857 Minnesota Census it states that the oldest members of the family were born in Ireland. The 1875 Minnesota State Census for Owen’s sister Catherine and her family, who were living in Glendale, Scott County, Minnesota, records Owen and Catherine’s father living in her household and clearly identifies Ireland as his place of birth. The 1880 U.S. Federal Census shows the family of Owen Kiernan living Maryville, Nordaway County, Missouri, and states that Owen’s father and mother were born in Ireland. The 1882 Minnesota Death Record for Felix Kiernan states he was born in Ireland. The 1884 Missouri Birth Record for Owen Kiernan’s son, George Edward Kernan (1884-1960), identifies Owen’s nationality as “Irish,” though it states he (Owen) was born in Canada. Finally, the 1901 Oregon Death Certificate for Owen Kiernan states that his parents were both born in Ireland. Table 1 below summarizes the origin of the Kernan Family according to these historical records. Thus, what is clear from both oral family history and available historical records is the Kernan family traces its origin back to Ireland. But from Where in Ireland? Although it is clear from oral family history and North American historical records that the Kernan family originated in Ireland, the question of specifically where in Ireland the family came from remains. Ordinarily, immigration records would be consulted in order to determine the specific location from which a person or family originated. However, tracking down immigration records for the immigrant ancestors of the Kernan family have proven unsuccessful. The reason for this may very well be that they do not exist. Although some immigration records exist for the period in which the Kernan family immigrated from Ireland to Canada, the 1830s (see “Kernan Immigration History”), they are not extensive as there was no requirement prior to 1865 for passenger and crew lists to be made or kept for immigration to Canada. Additionally, it is also possible that records that might pertain to the Kernan family’s immigration from Ireland, whether a passenger list or some other kind of record, are not currently available. Whatever the case may be, no immigration records have been found for the immigrant ancestors of the family. A clue that exists regarding the specific location within Ireland the family originated comes from the Bible of Delmar Clair Kernan (1908-1979), the father of my paternal grandfather. The information in question found within this Bible provides brief details about Delmar’s grandfather, Owen Francis Kiernan (1836-1901). According to this information, Owen was born in “1839” in “Northern Ireland.” No further specific details were recorded in the Bible or have been discovered that could narrow the specific location within Ireland any further. This information, moreover, was transferred to a family group sheet by my paternal grandmother, Margaret (Lapham) Kernan (1936-2004), a copy of which can be seen below. Although research into the Kernan family, and into the life of Owen Kiernan, reveals that the information in Delmar Kernan’s Bible regarding his grandfather, Owen Kiernan, is not completely accurate, as he was born in 1836 in Canada, it nevertheless reiterates a specific claim about the origins of the family passed down from generation to generation. Additionally, research does show that Owen’s parents were indeed born in Ireland, as revealed by the 1851 Canada Census and other historical records listed in Table 1 above. Hence, the accuracy of the claim of “Northern Ireland” as a slightly more specific origin of the family within Ireland, albeit a regional rather than a specific county and/or city or village, can be trusted with some degree of certainty. Despite the fact that the reference to “Northern Ireland” is not very specific (or as specific as one would like), it does narrow the number of places down from what is possible with just the identification of Ireland as the place from which the family originated. Thus, what is meant by “Northern Ireland” as recorded in the Bible of Delmar Kernan is important to the overall discussion of the origins of the family. Today, the term “Northern Ireland” refers to the northeastern region of the island of Ireland that is still a part of the United Kingdom rather than a part of the Republic of Ireland, which makes up the rest of the island. However, such a meaning only goes back as far as 1921, when Northern Ireland was officially created as a separate autonomous region and it was decided that it would remain a part of the United Kingdom following Irish independence. Considering these details and the fact that the Kernan family left Ireland in the 1830s (see “Kernan Immigration History”), it seems likely that the term “Northern Ireland” recorded in the Bible of Delmar Kernan refers to the historic northern province of Ireland, or Ulster Province, rather than the modern political region. Since 1921, this province has been divided between the United Kingdom and the Republic of Ireland. Nevertheless, the province consists of nine counties, which are Counties Cavan, Donegal, and Monaghan, Antrim, Armagh, Down, Fermanagh, Londonderry, and Tyrone. Additionally, the counties of the historic Ulster Province share a border with counties in both Connacht and Leinster Provinces, which are Counties Leitrim, Longford, Westmeath, Meath, and Louth. Although it may seem unlikely that the use of “Northern Ireland” could refer to these neighboring counties, it is entirely possible that they do. Although the entry for Owen Kiernan in the Bible of Delmar Kernan references “Northern Ireland” as the region of Ireland the family originates, recently made available historical records in Ireland provide more specific details. Surviving Irish birth and baptismal records for Catholic parishes provides the specific birth location for the earliest known Kernan ancestor in the United States, Felix Kiernan (1796-1882). An exploration of these records reveals a match for Felix in the collection of birth/baptismal records from Dundalk Parish, records for which exist between 1790 and 1881. According to his entry in this collection, Felix was born in 1796 and baptized on the 18 January 1796 in the village of Lisnawully in the Catholic Parish of Dundalk in County Louth. Located about 58 miles away from Dublin and a little over a mile away from the town of Dundalk, Lisnawully is a small village in the Barony of Upper Dundalk in County Louth. It is part of a rural area of the barony and county. At the time the family lived there, Lisnawully was mainly an agricultural village. However, the nearby town of Dundalk had a thriving whiskey distillery and was an important center of trade from its ports. From these ports many different agricultural products and livestock were exported to British ports. Although it is possible members of the Kernan family were involved in some of these lines of work, they were likely involved in farming, given the connection that many of the earliest known members of the family had with agriculture, particularly in North America. Additionally, Felix’s parents, Patrick and Bridget Kiernan, were also likely born in Dundalk Parish, though no records are currently available that confirm this. However, records show they did not stay there, as it appears that they moved to the village of Kieranscross in the Catholic Parish of Monasterboice in County Louth, where they died and were buried, Patrick in 1835 and Bridget in 1843. Kieranscross is a village in the Barony of Ferrard in County Louth and is about 20 miles to the south of Lisnawully. Currently available birth and baptismal records also provide the specific birth location for Felix’s wife, Martha Rose Sheridan (1797-? ), though in a different parish and county than for Felix. A match for Martha was found in the collection of birth/baptismal records from Clonmellon Parish, records for which exist between 1759 and 1872. According to her entry in this collection, Martha was born in 1797 and baptized on the 24 June 1797 in the village of Archerstown in the Catholic Parish of Clonmellon in County Westmeath. Located about 49 miles away from Dublin and about 4 miles away from the town of Delvin, Archerstown is a small village in the Barony of Delvin in County Westmeath. As with Lisnawully, Archerstown is part of a rural area for which agriculture has been the most significant economic industry. In the 1830s, the area was primarily “under tillage and pasture.” It is highly likely that Felix, as well as Martha’s father, was involved in such work, as he likely were in Lisnawully and in North America. As with Felix’s parents, it is highly likely that Martha’s parents, Owen and Bridget Sheridan, were born in Archerstown or another village in Clonmellon Parish, though no records are currently available that confirm this. However, records do show that they were married in Clonmellon Parish in 1788. Records also show that they also died in Clonmellon Parish, Owen in 1835 and Bridget in 1847. In addition to records for Martha’s birth/baptism, and the marriage and deaths of her parents, a match for Felix and Martha’s first child, Matthew, was also found in the collection of birth/baptismal records from Clonmellon Parish. According to his entry in this collection, Matthew was born in 1826 and baptized on the 16 February 1826 in the village of Archerstown in the Catholic Parish of Clonmellon in County Westmeath. Although Felix and Martha had one more child, Bridget, that was born in Ireland before they immigrated, no matches have been found for her in available birth and baptismal records for Catholic parishes. Furthermore, surviving marriage records for Catholic parishes also provide the specific marriage location for Felix and Martha. A match for Felix and Martha’s marriage was found in the collection of marriage records from Clonmellon Parish, records for which exist between 1757 and 1872. According to their entry in this collection, Felix and Martha were married on the 31 July 1825 in the Catholic Parish of Clonmellon in County Westmeath. Although it does not state the name of the village, it seems likely that it was Archerstown, as they were still living there by the birth of their first child. Thus, despite the ambiguity of oral family history, family records, and North American historical records regarding the origins of the Kernan family, the earliest Irish historical records show that the family traces to the village of Lisnawully in County Louth. Irish historical records also show that prior to immigrating to North America in the 1830s, the family lived in the village of Archerstown in County Westmeath. Although County Louth and County Westmeath are not located within historic Ulster Province, but Leinster Province, and thus not in the “Northern Ireland” recorded in the entry for Owen Kiernan in the Bible of Delmar Kernan, they are among the counties that neighbor it. Table 2 below summarizes available Irish records and what they reveal about Kernan family origins. With the discovery of specifically where in Ireland the Kernan family originated, it is interesting to consider the general historical origins of Kernans in Ireland. The identification of “Northern Ireland,” or rather historic Ulster Province, as the origins of the Kernan family is not too difficult to accept, as it seems that many bearing the surname trace to this part of Ireland, as well as some of the surrounding counties that share a border with it. Many general accounts, including surname origin studies, surname-based surveys of historical records, clan and distribution maps, and genetic studies, show a strong historical association of Kernans with this province and surrounding counties. Surname studies such as those found in Rev. Patrick Woulfe’s Irish Names and Surnames (1923) reveals this for Kernans. According to Woulfe, the Kernan surname (and its variations) is thought to have emerged from six possible lines. The first is a branch of O’Rourke that were the Chiefs of Teallach-Dunchadha (Tullyhunco) in the western part of County Cavan. The second of these lines is a branch of O’Connor in County Roscommon, which is in Connacht Province. The third line is a branch of Maguire (MacGuire) in County Fermanagh and County Donegal, where they were the chiefs of Clan Fearghaile. The fourth line is as a variation or branch of O’Kernaghan of Meath, where they were Chiefs of Luighne (now barony of Lune), and as a branch of the Tirconnell family of County Donegal, where they were Chiefs of Tuath-Bladhach (now Doe in the barony of Kilmacrenan). A fifth line is a possible variation or branch of O’Tiernan in County Mayo and County Westmeath, where O’Tiernan is thought to be a variation or alias of O’Tierney. The sixth line is a variation of O’Tierney in one of three likely branches: in County Donegal where they were Chiefs of Fearnmaigh, in County Mayo where they were a branch of the Ui Fiachrach and Chiefs in Ceara (now Carra), and in Westmeath where they were a branch of Ui Neill. For a summary of these six lines of origin and where they are associated, see Table 3 below. What is clear from these six lines is that Kernans have an historical association with several counties of historic Ulster Province and those that neighbor it, specifically Counties Cavan, Fermanagh, Donegal, Leitrim, Meath, and Westmeath. A general surname-based survey of historical records also shows an historical association with historic Ulster Province and the counties that neighbor it. Although many records were either destroyed in the 1922 fire at the Public Record Office in the Four Courts building in Dublin or were lost over time, many fragments, complete records, summaries, and indexes have survived and have been made available to varying degrees. Early examples of these records, particularly those dating before the Kernan family immigrated in the 1830s, include the “Pender Census of 1659” and the “Tithe Applotment Books (1823-37).” Although the “Pender Census” does not provide any details for Counties Cavan, Galway, Mayo, Tyrone, and Wicklow, it does provide some useful information. According to this record, the “Kiernan” surname is principally found in Counties Roscommon and Longford, while the “Kernan” surname is principally found in Counties Counties Dublin, Longford, and Westmeath. According to the Tithe Applotment Books, which were gathered to assess a tithe to the Church of Ireland on agricultural land over an acre, Kiernans were primarily found in Counties Longford, Leitrim, Clare, and Cavan, with lesser numbers in Counties Westmeath, Meath, and Dublin. Additionally, it shows Kernans were primarily found in Counties Monaghan, Cavan, and Westmeath, with lesser numbers in Counties Westmeath, Kildare, and Meath. More commonly consulted Irish historical records were collected after the Kernan family immigrated to North America. Nevertheless, these sources can provide some useful information. The earliest of these is the “Griffith’s Valuation (1847-1864),” which was recorded in order to determine property taxes. It shows Kiernans were primarily found in Counties Longford, Cavan, and Leitrim, with lesser numbers in Counties Meath, Westmeath, Dublin, and Monaghan. This record also shows that Kernans were found in Counties Meath, Monaghan, Armagh, Cavan and Dublin, with lesser numbers in Counties Westmeath, Leitrim, and Tyrone. The 1890 Births Distribution, which shows the principal locations of birth registrations for surnames in 1890, shows that the greatest number of births were in Counties Dublin, Longford, Leitrim, and Cavan. Additionally, the 1901 Census of Ireland shows the greatest number of Kiernans in Counties Longford, Leitrim, and Cavan, with lesser numbers in Dublin, Westmeath, and Meath. It also shows that the greatest numbers of Kernans is in Counties Dublin, Armagh, and Monaghan, with lesser numbers in Cavan, Antrim, and Meath. The 1911 Census of Ireland also shows the greatest numbers of Kiernans in Counties Longford, Dublin, Cavan, and Leitrim, with lesser numbers in Westmeath and Meath. It also shows that the greatest number of Kernans is in Counties Dublin and Cavan, with lesser numbers in Armagh and Monaghan. Table 4 below summarizes the historical records and the counties that show the greatest concentration of Kernans. Thus, this survey of Irish historical records shows that the Kernan or Kiernan surname (and its variations) is associated with and concentrated in particular counties in Ireland. Specifically, counties of historic Ulster Province and those neighboring it, namely Counties Cavan, Armagh, Monaghan, Longford, Leitrim, Westmeath, and Meath. Another common source for identifying the counties of origins for particular surnames in Ireland that is closely related to both surname studies and surname-based studies of Irish historical records are clan and surname distribution maps. These maps graphically represent the county or counties within Ireland of which a surname is associated. Several clan maps have emerged over the years, both in print sources, such as atlases, and commercial websites. An early Irish clan map is the 1795 map entitled “Ortelius Improved, Or a New Map of Ireland: Wherein are Inserted the Principal Families of Irish and English Extraction, Who Possess’d That Kingdom on the Commencement of the Seventeenth Century” engraved by S. Thompson. Both the surname “MacKiernan” and “MacTiernan,” which are variations of Kiernan/Kernan, are recorded on the map as having an historic association with County Cavan. Additionally, a 1956 map entitled “First Families of Old Ireland” by Edwin L. Sundberg and published in the Chicago Daily Tribune also records “MacKiernan” and “MacTiernan” on the map as having an historic association with County Cavan. In addition to clan maps, moreover, several surname distribution maps have also emerged over the years. As mentioned above, these maps usually associate a surname with a county or counties based on data from specific Irish historical records. 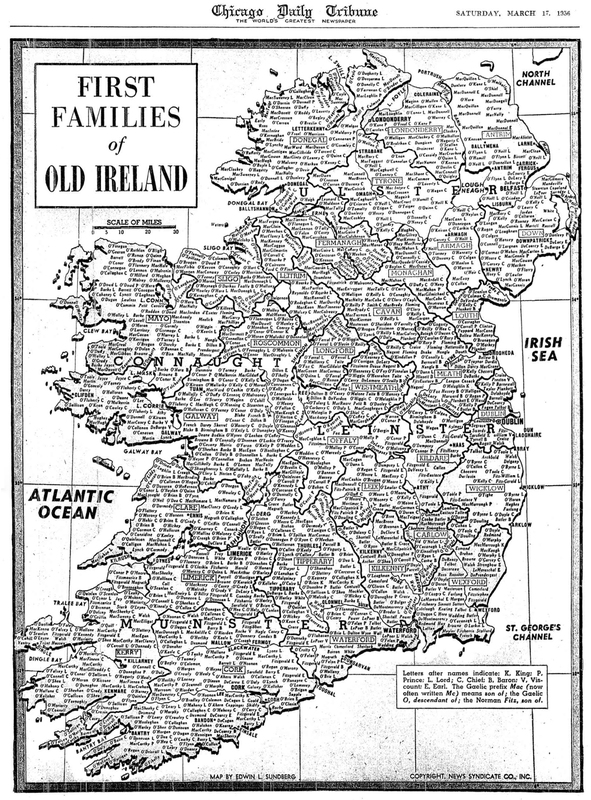 John Grenham’s “Irish Ancestors” (formerly a part of Irish Times), for example, provides several surname distribution maps all of which are based on Irish historical records, such as “Griffith’s Valuation (1847-1864),” “The Pender Census of 1659,” and the 1901 Census of Ireland and the 1911 Census of Ireland. According to Grenham’s information, the surname “Kiernan” is most significant in counties of historic Ulster Province were Cavan, Longford, and Leitrim, as well as counties Westmeath and Meath. The surname “Kernan” is most significant in counties were Monaghan, Armagh, and Cavan, as well as Antrim. The surname “McKiernan” is most significant in counties Cavan and Leitrim, as well as counties Tyrone, Antrim, and Fermanagh. Additionally, the surname “McKernan” is most significant in counties Tyrone, Antrim, Armagh, Fermanagh, and Cavan, as well as Leitrim and Monaghan. This exploration of clan and surname distribution maps, moreover, shows that the Kiernan and Kernan surname (and its variations) is significantly concentrated and has an historic association with particular counties in Ireland. Based on these maps, the counties of historic Ulster Province or those that neighbor it are Counties Cavan, Leitrim, Fermanagh, and Antrim, as well as counties Longford, Monaghan, Tyrone, and Armagh. Apart from the various studies and sources discussed so far, recent genetic studies concerning Irish surnames have proved to be another valuable source for identifying possible origins within Ireland. Dr. Tyrone Bowes’ website “Irish Origenes” provides both a DNA testing service and a details on common Irish surnames in his “Surnames Database.” According Bowes, “Since Irish surnames can still be found concentrated in the area where they first appeared, one can examine the distribution of the surnames that appear in ones DNA results and identify an area common to all and pinpoint a ‘Genetic Homeland. '” The following will explore some of Bowes’ findings as they relate to the origins of the Kiernan/Kernan surname (and its variations). According to Bowes’ studies, the greatest genetic concentration of “Kiernans” are found in Counties Longford, Dublin, Cavan, Leitrim, and Westmeath. Additionally, Bowes’ studies also reveal that the greatest genetic concentration of “Kernans” are found in Counties Dublin and Cavan, that the greatest genetic concentration of “McKiernans” are found in Counties Leitrim and Cavan, and that the greatest genetic concentration of “McKernans” are found in Counties Tyrone, Antrim, and Armagh. Bowes’ studies also reveal that the greatest genetic concentration of “Tiernans” are found in Counties Roscommon, Leitrim, Dublin, Louth, and Mayo, that the greatest genetic concentration of “Ternans” are found in Dublin and Mayo, that the greatest genetic concentration of “McTiernans” are found in Leitrim and Sligo, and that the greatest genetic concentration of “McTernans” are found in Leitrim and Sligo. Bowes’ studies, moreover, have concluded that the “genetic homeland” of persons bearing the “Kiernan” surname is County Longford, that the “genetic homeland” of persons bearing the “McKernan” surname is County Tyrone, and that the “genetic homeland” of persons bearing the “McTernan” surname is County Leitrim. Table 5 below summarizes the primary and additional counties of genetic origins and the “genetic homeland” for the Kiernan/Kernan surname and other variant spellings according to Bowes’ studies. What is clear from this exploration of Dr. Tyrone Bowes’ studies on “Irish Origenes” is that genetics show a strong association of Irish surnames with specific counties. According to Bowes’ studies, County Cavan is the only primary county for the surname “Kiernan” that is in historic Ulster Province. Additional primary counties that neighbor Ulster Province are counties Longford, Leitrim, and Westmeath, with County Longford having the greatest genetic concentration as the “genetic homeland” for “Kiernan.” Furthermore, Bowes’ studies show that the only primary county for the surname “Kernan” in Ulster Province is County Cavan. Additional primary counties are identified by Bowes’ studies for variations of the surname, as well as the “genetic homelands” of County Tyrone and County Leitrim. However, it is unclear if these have an immediate relationship with the Kernan family, whose earliest known ancestor went by both the Kiernan and Kernan variations of the surname. Oral family history and historical records for the Kernan family are clear about the country of origin for the family. Both of these sources reveal that the family traces back to Ireland. However, these sources do not provide the specific city/town, parish, or county within Ireland the family came from. The only other information that is provided by oral family history is a reference to “Northern Ireland,” which likely meant Ulster Province. A review of general sources that could be used to track down the historic origins of the family show that those baring the Kernan surname (and its variations) have a strong association with historic Ulster Province or counties that neighbor it. Surname studies show an association with Counties Cavan, Fermanagh, Donegal, Leitrim, Meath, and Westmeath. A surname-based survey of Irish historical records shows an association with Counties Cavan, Armagh, Monaghan, Longford, Leitrim, Westmeath, and Meath. Clan and surname distribution maps show an association with Counties Cavan, Leitrim, Fermanagh, and Antrim, as well as counties Longford, Monaghan, Tyrone, and Armagh. Additionally, genetic studies show a strong association with Counties Cavan, Longford, Leitrim, Westmeath, Monaghan, Fermanagh, Armagh, Antrim, and Donegal. Although it is possible that the Kernan family ultimately traces to one of the counties identified by general sources at some point in history, recently made available historical records in Ireland provide more specific details. Despite the oral family tradition of “Northern Ireland” as the general location within Ireland the family traces to and the strong association with counties of Ulster Province or those that neighbor it revealed by general sources, these records, which include birth/baptismal, marriage, and death records, show that the Kernan family traces to two specific locations in Ireland. The earliest of these is to the village of Lisnawully in County Louth, where the earliest known ancestor of the family, Felix Kiernan (1796-1882), was born. These records also show that prior to immigrating to North America in the 1830s, the family lived in the village of Archerstown in County Westmeath, where Felix married his wife, Martha Rose Sheridan (1797-? ), and where they had their first child. Published 07/13/2012. Last Updated 02/14/2019.